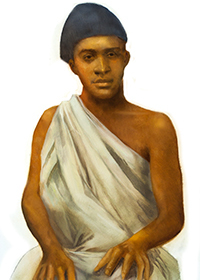 Charles Lwanga was the assistant to the master of pages in the court of King Mwanga of Uganda. Joseph Mukasa, a Catholic, was his superior. Mukasa chastised the king for his murder of a Protestant missionary, as well as for the king’s homosexuality and his corruption of the young pages. This served to intensify the king’s hatred of Catholics and Joseph Mukasa was ordered slain by the king. Charles, having been under instruction in the Catholic faith, asked for and received baptism on the day that Mukasa was killed. For his own unwillingness to submit to immoral acts and his defense of the other pages, Lwanga and fourteen other pages who were Christian were sent to a prison. Enroute, three of the pages, including Lwanga, were murdered, burned to death along with two soldiers. During this persecution, some one hundred people were killed, including one young catechist speared to death by King Mwanga himself. Other martyrs included tribal chiefs and judges. St. Charles Lwanga, together with twenty-one other martyrs, was canonized in 1964 by Pope Paul VI. He has been named the patron of African youth. He, and his companion martyrs are honored by a memorial on June 3. Charles' message today: What strong faith this young man had! Knowing that it would probably lead to his own martyrdom, he persevered in his request for baptism. Then he stood up to the king, defending himself and others against what he knew to be wrong. Think of some ways that you can help a young person affirm their faith. Pray for those in your parish who are to be confirmed this year.